There’s been a rather fascinating cultural shift around zombies, presumably due to the now past Mayan apocalypse that didn’t happen December 22. Before this, it seems that film and television including zombies and the like were strictly the stuff of b-movies and edgy but mainstream folks like Rob Zombie. My first notice of the seriousness of this trend came when I watched a few episodes of Walking Dead on Netflix one night and saw that it was well done and included the efforts of Frank Darabont, who wrote and directed Green Mile and Shawshank Redemption, among other things. I got hooked into the story and survival of the characters. Then I noticed other trends, like games featuring zombies. In my own home, my children have gotten sort of hooked on Plants vs. Zombies by PopCap Games on their tablet devices. I saw it gather more steam when I saw the trailer for Warm Bodies, a comedic feature due out in February of 2013, and World War Z, featuring Brad Pit, due out in June 2013. Even the U.S. military got on board with it and created a training exercise to prepare for the zombie apocalypse, prompting a government denial of any impending zombie action. I feel like I’ve sort of missed the bus myself, not being forward thinking enough to get some Jones material rolling featuring the life of the undead. My friend and fellow cartoonist Rod Salm answered the call recently in his Death At Your Door strip with a recent strip featuring a supporting cast of zombies. I have to say, I’m more into the whole thing that I would have guessed. I’ve never been a consumer of horror media, vampire movies, gore, or gothic stuff. Last year I starting enjoying Rob Zombie, Marilyn Manson, Korn, and other darker music, and I also found Walking Dead compelling enough to buy the 2012 season on iTunes. 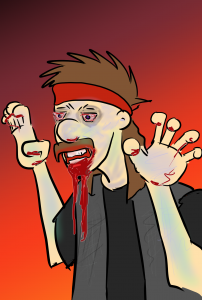 I never really got on board with the whole zombie thing. I figure the live people are enough trouble as it is, without the dead ones coming back too. Not into zombies or vamps, ghosts maybe. save that stuff for Halloween. Great strip!